The Heskel Group has assumed a leading role in the development of Forest Hills, Queens, and Manhattan's commercial and retail space. The Heskel Group has earned a reputation as an extremely efficient builder, with an unblemished record of on-time, within-budget completion. A pioneer in the introduction of triple A business tenants to the Austin Street neighborhood. The Heskel Group's overall objective is not just growth, but quality growth--continuing to bring the prestige of Manhattan without the price. The Heskel Group understands the interplay between glamour, elegance, architecture and technology to attract a sophisticated cross-section to an area. In The Heskel Group's case this area is Forest Hills, Queens. 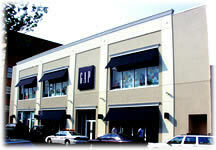 The expansive 22,000-square-foot Gap store on Austin Street includes Gap, BabyGap, GapKids and Body Gap. The newest design in Blockbuster video stores at 70-31 Austin Street, adjacent to The Disney Store opened on Friday, July 23rd, 1999. This is the first and only video store to open within the Austin Street shopping area ever. It's been twelve years in the works and a much needed service store for the Forest Hills' shoppers and residents. 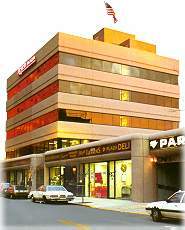 The Duane Reade flagship drugstore located at 107-16 Continental Avenue (formerly the Forest Hills Twin movie theatre) opened up for business on Saturday, August 28, 1999. The Heskel Group restored the entire facade of this extraordinary building originally constructed in the early 1900's. The Group painstakingly took digital images of every section of the front and recreated it with modern materials-- taking templates from the stone, recasting it and replaced it with all new material. Duane Reade encompasses 9,000 square feet of the first level of this building. A good example of The Group's innovation is the construction of The Disney Store in 1996 located at 70-25 to 70-31 Austin Street, Forest Hills. The building that was previously on the site was torn down and a new building constructed from scratch to accommodate the 7,000 sq. feet, one-of-a-kind superstore costing a total of $5,000,000. The customization included a column-free design and 18 ft. ceilings. The Heskel Group even had a specific blue colored brick manufactured for them in Houston. Queens Borough President Claire Shulman was quoted as saying "Heskel is Queens’ Ambassador of Good Will who will hopefully bring more Disney’s to Queens." The Heskel Group has always realized the commercial draw that movie theatres bring to an area. Over the years The Heskel Group has acquired several UA theaters in the Forest Hills section of Queens -- continuing to enhance and develop these movie houses and surround them with triple A retail tenants that match the style and needs of the neighborhood. UA Brandon Cinemas, located at 70-20 Austin Street opened on March 31, 1999, sixty days ahead of its target opening date. Its high-back rocker seats, high-tech projection and digital sound system complete the intimate setting of this movie house. Already it's one of the highest grossing theatres per seat in the United Artist national chain. 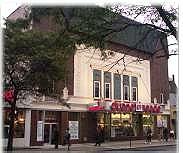 The Heskel Group's Midway Theatre located at 108-22 Queens Blvd., Forest Hills re-opened in November 1998 after major renovations. The theatre expanded from four to nine screens, elevators and state-of –the-art stadium seating with cup rests. Redesigned for an unobtrusive movie-watching experience, no columns were constructed in the middle of the structure. The Midway features two huge concession stands with snacking choices far beyond popcorn. Art moderne exterior, lobby and staircase remains from the original Midway, built in 1942 and named after the historic World War II battle. In 1985 The Heskel Group built the flagship Heskel's Plaza at 68-60 Austin Street, changing the face of this section of Austin Street which was then considered "the warehouse district". This state-of-the art professional center housed American Express, First Federal Bank and Merrill Lynch Medical among others. The largest MRI center in the United States was contracted on the 5th floor of this building, which was an innovative undertaking because up until then such facilities had always occupied the ground floor of a building. Click here to learn more about the construction of this MRI center and other Heskel Group's medical developments. Heskel's Plaza was sold in 1989 but The Group's influence still remains in the name. Heskel's Professional Center was originally constructed in 1987 at 70-10 Austin Street. 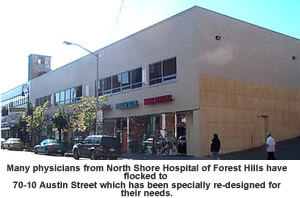 A $2,5000,000 reconstruction was completed in April, 2003 to accommodate Forest Hill's medical community. The Heskel Group is known for attracting and implementing triple A tenants. Developing the area of Forest Hills for over 25 years The Group has an understanding of the needs of the community and have proven to have the aggressiveness and persistence to lure the best.